Parallax. 2003. 50 minutes 8 channel slide installation in an educational setting. Parallax investigates the notion of "citizenship" and "national belonging" and their role in creating individual and governmental spaces of action. It is staged within the current political and social climate of large US cities. The project takes the form of an eight-channel slide projection in a stylized educational setting. 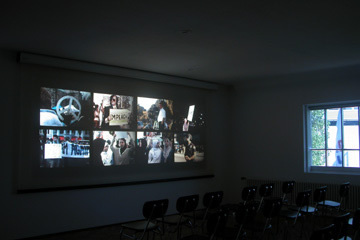 The slides combine text excerpts from news agencies (The New York Times, Reuters, AP, CNN, Democracy Now) with photographs taken in the first six months of 2003 in New York and Los Angeles, and a group of staged photographs that follow a female protagonist on her way through her everyday life. Just as the photographs of the street scenes establish a reference to a certain knowledge that describes how the locations they depict function, the introduction of the anonymous protagonist describes the relation of the individual to media information, to the state and its politics, shown as a structural element of the systems described. To a certain extent, the figure also embodies the question of how the anticipatory and emancipatory practices of acting subjects relate to actual political interrelations. The character’s appearance is marked by my own positionality in the work, yet she is not an alter ego. Instead, like the woman in Interim, the protagonist in Parallax is a kind of universal character, fleetingly but nevertheless distinctively marked by the specificity of her external appearance in the picture, and the significance of that in regards to the events unfolding. In addition to the staged scenes, the photographs of Parallax also show the periphery of mass demonstrations against the US invasion of Iraq, and against domestic restrictions accompanying foreign policy aggression, such as changes in immigration laws and the surreptitious redefinition of the rights of citizens, as well as administrative situations such as courthouses, waiting rooms, libraries, and also the increasing presence of state executives, such as military and police in public spaces. The text excerpts reflect in one way or another on issues surrounding the basic duties and constitutional rights of American citizens and their constant subversion. In their combination, the news reports often go beyond the actual communication of events/facts and reveal their claim of "objective reporting" in relation to the immanent constant rewriting of those events and histories.